It’s BC Day on August 3 and we have a glorious long weekend ahead of us, full of sunshine and summer festivities. Enjoy the holiday weekend with family and friends and celebrate beautiful British Columbia. Here are our top five events in and around Metro Vancouver. As streets and shops are being decorated with rainbow-coloured accessories, Vancouver is preparing for one of the most anticipated events of the year. 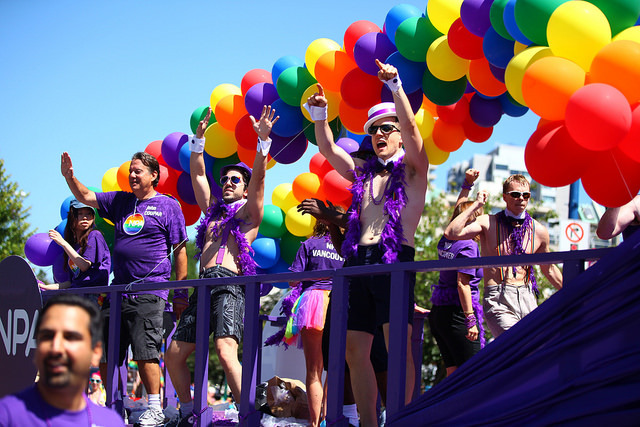 The Vancouver Pride Parade 2015 is the highlight of a week full of fun festivities, music, and crazy outfits celebrating diversity, LGBT culture and pride. Over 650,000 participants from all walks of life are expected to attend this year’s parade and party under the sparkling sun. Where: The parade starts at the intersection of Robson and Thurlow, then runs along Robson Street, Denman Street and Beach Avenue and ends at the Sunset Beach Festival site. Get ready for Vancouver’s largest free community concert series at English Bay and Sunset Beach Park this weekend and enjoy a day filled with music on the beach while you wait for the fireworks to begin. On two stages Shorefest features some of Canada’s top musical acts including Kuba Oms, Bros Landreth and Colleen Rennison. Alongside the music, there will be plenty of food, games and activities. What better way to spend the long BC Day weekend than watching Canada on Saturday night in the longest running offshore musical fireworks competition in the world? Don’t miss this last round and come down to English Bay and celebrate the 25th anniversary of the Celebration of Light – BC’s largest public event that’s guaranteed to bring oohs and aahs. Celebrating BC also means celebrating diversity and different cultures. The Powell Street Festival is dedicated to all things Japanese-Canadian and showcases Asian-Canadian arts performances like taiko drumming, sumo wrestling and martial arts. The festival, which is inspired by traditional Japanese celebration, also features historical walking tours, tea ceremonies and a wonderful selection of Japanese food, crafts and displays. This event is for everyone who loves photography, beautiful British Columbia and of course, Instagram. Photo friends will meet up at one of the Instameet locations, take photos and post them on Instagram using the hashtag #exploreBC. It’s a great way to meet new people and discover and capture the beauty of our province to share it with the world.